Good news for those who need to seat three children on the back seat of a car: you don't have to buy a minivan. Nor do you have to wait till carmakers finally see fit to sell the seven-seat gas sippers in the US that they've been offering elsewhere already. Nor do you have to go to radical solutions like the integrated three-child seat offered by Multimac. You have to look pretty hard, but you can buy narrow child seats that would fit three in a row, even in the back of a smaller car. 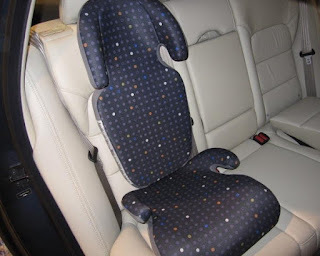 One example is the Volvo Booster Cushion. It comes with a detachable back rest that can be adjusted to several angles for comfort. You don't have to drive a Volvo to use this seat, it fits in any car outfitted with a three-point seat belt. The seat width is 15 inches. My 2012 VW Golf, not a particularly wide car, has a bench-type back seat (the seat has a continuous, flat, unsculpted surface) with a total width of 52" between the arm rests on the doors. Three of these Volvo booster seats would take up a total of 45", meaning there is space left between them to get to the seat belt receptacles. Are they safe? What can I say: Don't the Swedes love their children too? But if you're looking for an official rating, this seat gets high marks from the Insurance Institute for Highway Safety. The retail price is around $200. Sounds steep for a booster seat - then again, it beats having to buy a new car to accommodate your third baby. It's best to avoid putting a new baby in a new car, anyway. (NOTE: If you have young children, try to shop for a car with a flat-surface back bench, which offers flexibility in the positioning of multiple car seats).